Spoon's albums are incredibly detail-oriented. Every note rings out clearly, every arrangement holds together tightly and even the ostensibly chaotic bursts of effects and noise that sometimes punctuate the songs are carefully considered. This aesthetic perfectly complements the band's brilliant records, but has hindered live shows in the past. 2006's Pitchfork performance was a model of stiff competence, hardly embarrassing but not the ideal of what a concert should be. 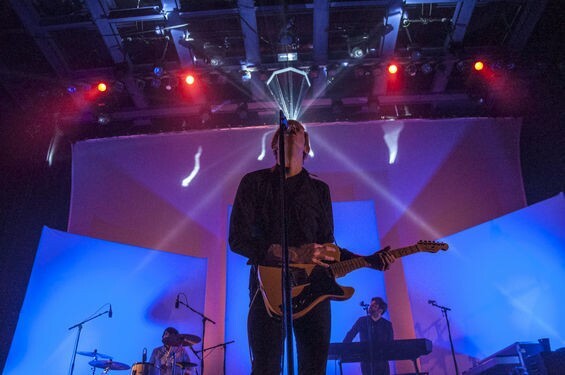 Judging from Saturday's tremendous show at the Pageant, however, Spoon's live problems are a thing of the past. The band cut loose with natural rock & roll swagger and energy over a set that spanned its past six albums and wowed the enthusiastic crowd. Strolling onstage to Chuck Berry's "Come On," Spoon launched into a propulsive arrangement of "Small Stakes" that added driving drums. Even from this earliest point in the show, the crowd was immediately enthralled. The now-quintet was locked in and tight on material that ranged from breezy pop-rock ("Do You") to haunting psychedelia ("The Ghost of You Lingers") to light funk ("Who Makes Your Money") to somber balladry ("Black Like Me"). The audience frequently clapped and participated without provocation; a section of girls around me nearly drowned out frontman Britt Daniel when singing along to "Don't You Evah." Meanwhile, Eric Harvey and newest member Alex Fischel rotated between keyboards, guitars and tambourines (the latter of which are more important to Spoon's music than you'd think), effortlessly covering all bases and even getting time to show off their slick soloing skills on a jam at the end of "Inside Out." Fischel in particular helps the band with his ebullient but not overbearing stage presence. He staggered and swooned like a madman when playing noisy guitar solos, and was happy to dance when relegated to tambourine duty. Drummer Jim Eno and bassist Rob Pope made sure everything stayed grounded with their understated, tasteful work, giving Daniel a platform to be a rock star in the best possible sense. His distinctively raspy voice was in fine form, and he seemed to be having a blast whether singing, complimenting a fan on an old-school Spoon shirt or hilariously failing at the "kick the mic stand and retrieve it with your foot" move. Truth be told, Spoon could have probably gotten away with a tight but near lifeless performance with its lighting production, which had enough stage presence on its own. The set boasted lights placed as such that they could cast the band's shadows on the several large white canvases adorning the stage, thus replicating the effect of the "Rent I Pay" video. The Pageant also bathed in several simple but beautiful color combinations, sometimes filtered through a hanging disco crystal and benefited from effective uses of searchlights and strobes. Like Spoon's production, it was colorful and sharp without being overly flashy. All of that wouldn't matter if Spoon played poorly or made bad music. It didn't, and it doesn't. 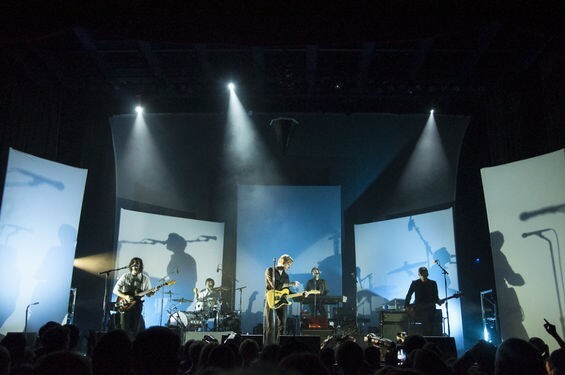 Daniel and company showcased their fantastic and outrageously consistent catalog with a winning concert that perfectly illustrated why Spoon is the most critically praised act of the last decade. 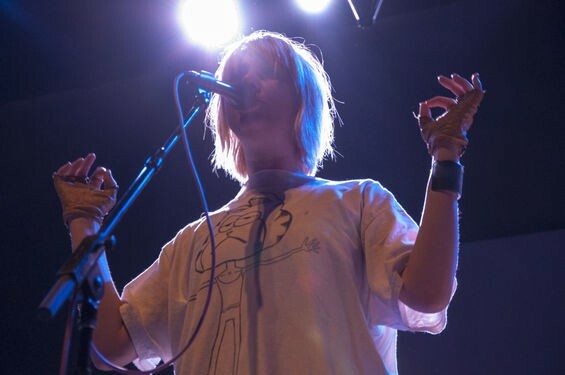 EMA was a curious choice for an opener considering that where Spoon deals in minimalist, detached cool, Erika Marie Anderson and her band explore ugly emotions through explicit lyrics and cathartic yells. This is a generalization of both acts, but the contrast between them is real and made for a funny fit. Nevertheless, EMA made the most of its short opening slot with a set that wrenched drama out of electronic soundscapes, skuzzy indie-rock reminiscent of the '90s and slow-building ballads. When not playing guitar, Anderson brought theater to the stage by wrapping the mic's cord around her neck, pointing at and at one point holding hands with audience members and kneeling through the entirety of "3Jane." She was ably supported by a band that juggled violin, synths, guitar and bass against an intriguing backdrop of four small monitors that displayed thematically appropriate video. Occasionally an otherwise fine drummer was unable to compete against the other instruments, and all of those instruments struggled in quieter moments with a chatty crowd, but those who paid attention were rewarded with a strong show. Notes and setlists on the following page. 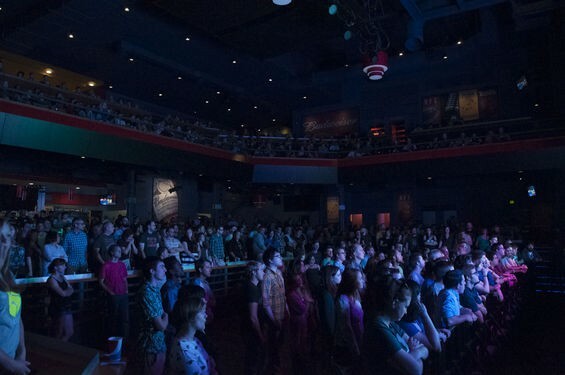 -This was the first Spoon show in St. Louis since the band played The Duck Room in June of 2004. -Alex Fischel said that the last time he was at the Pageant, he was underage and thus couldn't access the whole venue. Does anyone have any details about his last appearance here? -To the girl who kept yelling at Daniel to take off his shirt, please stop.